Assessment of safe endotracheal tube cuff pressures in emergency care: time for change? Assessment of safe endotracheal tube cuff pressures in emergency care - time for change? Over-inflation of ETT cuffs to pressures exceeding 30 cm H2O may result in serious complications including tracheal stenosis, tracheal rupture and tracheo-oesophageal fistula.3 Tracheal injury may occur after as little as 15 minutes with ETT cuff pressures exceeding 27 cm H2O.2 To avoid tracheal injury due to emergency intubation, it is important that ETT cuff over-inflation is avoided in the pre-hospital and ED phases of emergency care. Although ETT cuff pressure manometry is optimal in determining safe ETT cuff pressure, it is standard practice in the ED and in the pre-hospital emergency care environment to assess ETT cuff pressure using palpation of the cuff 's pilot balloon - a qualitative technique prone to subjective interpretation. The aims of the study were to describe the ability of a convenience sample of practising ALS paramedics and emergency doctors in Johannesburg to accurately estimate safe ETT cuff pressures using palpation of the cuff 's pilot balloon alone, and to determine whether there was any dependence between correctness of ETT cuff estimation and the practitioner's years of clinical experience and estimated monthly number of intubations. Each one of seven 7.5 mm internal diameter ETTs (Microcuff ETT, Kimberley-Clarke, Zaventem, Belgium) was placed in a single 20 ml syringe barrel to simulate a trachea. Each syringe barrel was covered with an opaque material to prevent the participant seeing the cuff inside the syringe. The ETT cuffs were inflated to seven different pressures (0, 10, 20, 40, 60, 80 and 100 cm H2O), using an electronic ETT cuff manometer (TRACOE Cuff Pressure Control, TRACOE Medical GmbH, Frankfurt, Germany). A convenience sample of ALS paramedics and emergency doctors was selected from various private and metropolitan emergency medical services in the Greater Johannesburg region, the Department of Surgery at the University of the Witwatersrand, and the Master of Science in Medicine (Emergency Medicine) student body at the University of the Witwatersrand. Each consenting participant was asked to complete a short questionnaire documenting their qualifications, years of clinical experience and estimated number of intubations per month. Participants were then presented with the seven described ETTs, in random order. After palpating each of the seven ETT pilot balloons, each participant verbally indicated one of three options: (i) pressure too low; (ii) safe pressure; or (iii) pressure too high. Results were recorded by a researcher and checked by another. Questionnaire responses were analysed descriptively. Sensitivity and specificity for identification of safe endotracheal tube cuff pressures were calculated, with the 20 cm H2O cuff pressure considered to be safe and cuff pressures below and above this considered to be too low and too high, respectively. The dependence between correctness of ETT cuff pressure estimation and practitioner's years of experience and estimated monthly intubations was assessed using chi-square tests. Data analysis was performed using SPSS (version 15.0, SPSS Science, Chicago, USA), and p<0.05 was considered significant. Ethical clearance for the study was obtained from the Faculty of Health Sciences Academic Ethics Committee, University of Johannesburg. Of 44 consenting participants, 55% (24) were emergency doctors. Of these 19 (79%) had 5 or more years of clinical experience, while 10 (50%) ALS paramedics fitted this category; 15 emergency doctors (58%) and 9 ALS paramedics (45%) reported an estimated average of more than 5 intubations per month. Sensitivity and specificity for identification of safe ETT cuff pressure overall were 0.27 and 0.72, respectively. Sensitivity and specificity for emergency doctors were 0.29 and 0.73, and for ALS paramedics 0.25 and 0.71. No dependence was found between correctness of ETT cuff pressure assessment and years of clinical experience (p=0.957) or estimated average intubations per month (p=0.257). Fig. 1 shows counts of estimated ETT cuff pressure categories for each measured cuff pressure. Most participants estimated the correctly inflated ETT cuff as having a pressure that was 'too low', while between 25% and 50% of the participants estimated ETT cuffs with pressures between 40 and 100 cm H2O to be 'safe'. 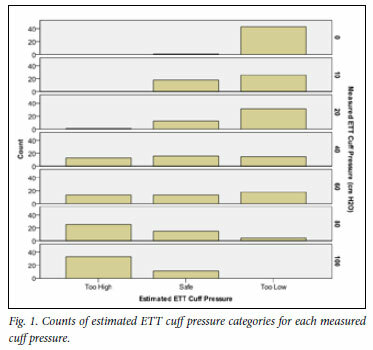 More accurate estimation was only seen at extremes of ETT cuff pressure. Correct ETT cuff pressure should be ensured at the time of intubation. This can only be done effectively using a quantitative technique such as manual or electronic ETT cuff manometry. Even after initial inflation to a safe pressure, ETT cuff pressures should be monitored regularly in every patient during the entire duration of emergency care, and afterwards in the intensive care setting. By extension, similar measures may be needed in other environments, such as intra-operatively, where some patients may be exposed to high ETT cuff pressures for prolonged periods. This study highlights the inadequacy of qualitative ETT cuff pressure assessment by practitioners who regularly perform emergency endotracheal intubation. This form of testing for safe ETT cuff pressures is inappropriate, and there is a risk of significant morbidity associated with tracheal injury caused by cuff over-inflation. It is therefore time to equip and train those involved in emergency care appropriately to prevent complications of endotracheal intubation. This means making the use of ETT cuff pressure manometers mandatory throughout the continuum of emergency and critical care.